Originally published in The Clarinet 46/2 (March 2019). Printed copies of The Clarinet are available for ICA members. Bret Pimentel is associate professor of music at Delta State University, where he teaches applied oboe, clarinet, bassoon and saxophone. 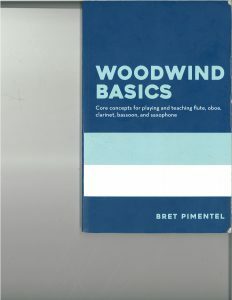 He has extensive experience teaching woodwind methods, and this volume, the succinctly titled Woodwind Basics, is a small but thorough excursion into the fundamentals of woodwind playing. 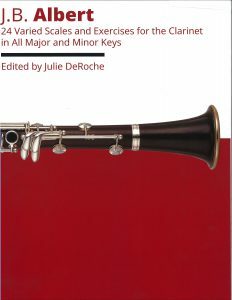 The book is separated into 15 short chapters including embouchure, finger technique, articulation, tuning, and posture and playing position, among others. Each chapter concludes with review questions that are useful for reinforcement for the casual reader, or preparation for an instrumental methods class quiz. The illustrations are simple black-and-white line drawings, but concise and informative. Most chapters include tables that diagnose specific topics, separated into “Issues,” “Causes” and “Solutions.” These quick-hit graphs are terrific for the non-wind player trying to rectify wind player difficulties. There is always much more in the performance of woodwind instruments than we realize. The wonderful thing about a volume like this is that it highlights the similarities and challenges that exist in woodwind instruments, especially details like voicing, hand position and air speed. Pimentel makes the connections, cutting through excessive explanations to get to the heart of the matter. His target audience for the book includes teachers of college woodwind methods courses (the price is affordable for college students), private teachers, school band directors and woodwind doublers looking for secrets to improve on the more unfamiliar instruments. Woodwind Basics is a clean, efficient little volume of information that is incredibly useful for musicians of wide-ranging ability levels. This book should be on the shelf of beginning school band directors and college instrumental methods instructors. 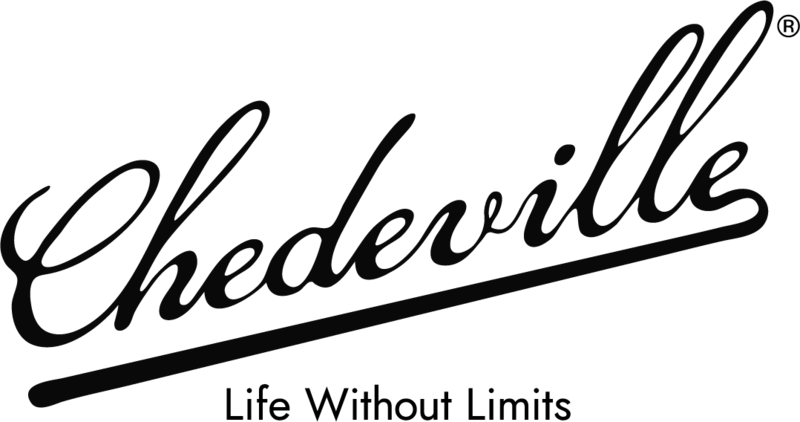 B. Albert’s 24 Varied Scales and Exercises, revised by Paul de Ville, has been published by Carl Fischer since 1905 and has been a staple for many advancing clarinetists due to its proven effectiveness. Julie DeRoche’s edition has revitalized the exercises with a detailed introduction and explanation of her successful practice method. I concur with her comment that “I can guarantee that if you have the patience to follow this [her suggested approach] exactly, you will improve dramatically in a short time.” DeRoche’s introduction is a master class in how to approach technical and all-around improvement. By reading it you will have a detailed plan for awareness and progress. Her own playing accomplishments are strong motivation to follow her suggestions. DeRoche uses the graduated tempo method with her DePaul University students. The exercises in the new edition contain the same notes as in the older. Each page is still devoted to exercises in a single key, but the new format emphasizes legato and the ethos of the long tone study – here accompanied with moving fingers. Rhythmic values are subtly altered – 16th-note sextuplets replace eighth-note triplets. A further modernization is the inclusion of not only the original G-flat major and E-flat minor exercises but also their repetition printed as F-sharp major and D-sharp minor. With these two new keys, there are in actuality 26 varied scales and exercises that will nicely fit into two uses, if following DeRoche’s method, in a 52-week year. French composer and organist Thierry Escaich (b. 1965) has reached the top echelon of musicians with performances of his works by the Berlin Philharmonic and the Philadelphia Orchestra. His large output – over 100 works – includes several featuring the clarinet. Appropriately, he was commissioned by the Toulouse Single Reed Competition for a required work in the final round, which was held in January of 2019. 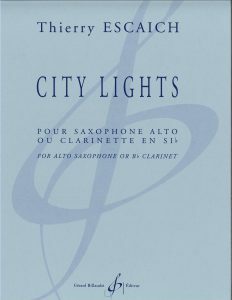 That work, City Lights, is playable on either B-flat clarinet or alto saxophone. The sounding pitches are the same in both versions and both versions are included as a set from Billaudot. Looking at the score, printed on three large, landscape-orientation pages, the propulsive dynamic and rhythmic growth of the work is visceral. Fast tempos, highly syncopated rhythm, exciting dynamic indications, engaging use of slap and flutter tongue, key clicks and a brief passage with expressive quarter tones add up to a piece that is fun to play and that dazzles an audience. This is an advanced work due to rhythmic complexity, the above mentioned techniques, rapid tonguing and several passages of finger twisters. City Lights sparkles. Shulamit Ran’s landmark work for solo clarinet, For an Actor: Monologue for Clarinet, is just as vibrant today as it was in 1978 at its premiere with Da Capo Chamber Players clarinetist Laura Flax. 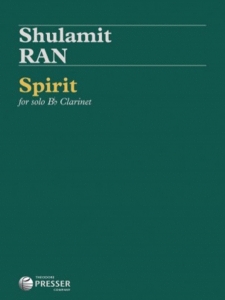 After the passing of Flax in 2017, Ran celebrated their friendship and musical association with this new work, Spirit, also for solo clarinet. How has a 39-year span altered Ran’s style and idiomatic use of the clarinet? For an Actor is one of our most dramatic and contrast-filled standard repertoire pieces. The juxtaposed elements found in For an Actor are retained in Spirit. The dynamic in measure three is ff and the next p. There are 80 dynamic markings in Spirit’s seven-minute duration. Likewise there is great temporal variety ranging from quarter note = 46 to passages where the pulse is 138 beats per minute. Ran writes additional interpretive guidance with descriptive labels: Resolute, Graceful, Insistent, Gently Whispering, Emphatic and Slow-Ethereal all recalling to me similar directions in For an Actor. What are the stylistic differences between her two solo clarinet works? Though still modernistic and expressionistic, Spirit is less dramatic in terms of large leaps and extremely loud passages. Spirit begins with a tritone (though functionally a perfect fourth with an upper half-step acciaccatura) and is generally atonal but the concluding quarter of the work is marked with increasing triadic prominence and a sense of skirting around the edges of tonality. Motives are transformed and recalled giving Spirit unity and relatability. In general the music is more legato and less complex. There is no flutter tongue or multiphonics but there are two measures of key clicks and slap tongue. Probably by coincidence, Spirit and For an Actor both end on long, very soft concert E-flat fermatas. Spirit is emotionally rewarding to play and highly recommended. Ludovico Einaudi is an Italian pianist and composer. He was trained at the Verdi Conservatory in Milan. Afterward, Einaudi studied orchestration with Luciano Berio and was awarded a scholarship to the Tanglewood Music Festival. Einaudi composed scores for a number of films and trailers that include This is England, The Intouchables and I’m Still Here. His music is considered ambient, meditative and often introspective, drawing on minimalism, world music and contemporary pop music. This collection presents eight pieces originally for solo piano, transcribed for clarinet and piano: Discovery at Night, Divenire, Elegy for the Arctic, Four Dimensions, Night, Nuovale Blacnche, Primavera and Una Mattina. In addition, this book includes a range of supporting digital features such as Soundcheck, an assessment and feedback software that allows you to use your phone, tablet or computer to help you practice. There is an e-book edition that allows performers to read the music on any device, along with a full demonstration audio recording of each piece plus accompaniment-only and solo-only backing tracks. Einaudi’s compositions are beautiful to listen to because of their simplicity. These works are not technically challenging for the clarinet, and would be perfect repertoire for intermediate level and above. In comparison to the originals, the clarinet adds a pleasant palette of colors matching the character of each piece. The digital features are very useful for clarinetists to use for independent practice. 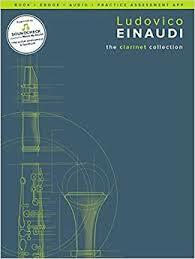 Overall, I highly recommend this clarinet collection! Rudolf Mauz studied clarinet with Professor Waldemar Wandel at the Staatliche Hochschule für Musik in Trossingen, where he received diplomas in music education and orchestral performance. His orchestral activities included the Junge Deutsche Philharmonie, Württembergische Philharmonie in Reutlingen, the Mannheim National Theatre and the Radio Symphony Orchestra of Stuttgart. In addition, Mauz has performed numerous world premieres and recordings of chamber music, klezmer and jazz. 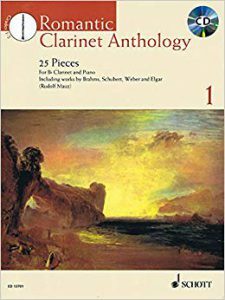 Mauz’s Romantic Clarinet Anthology Vol. 1: 25 Pieces for B-flat Clarinet and Piano is one of four volumes of arrangements for clarinet and piano. Mauz stated, “This creative collection of easy pieces is intended to open up the wealth of Romantic music to clarinetists in the early stages of their development.” Notable works by Schumann, Schubert, Offenbach, Dvořák, Brahms, Elgar, Mendelssohn, Grieg and Brahms – among other well-known composers from the Romantic era – were selected and arranged for clarinet and piano. According to Mauz, “they are suitable for studying in lessons, as well as repertoire for recitals and concerts.” The anthology includes a CD with accompaniment tracks. Mauz’s Anthology is geared towards beginner students or adult amateurs. It is apparent Mauz put a great deal of thought into the arrangements of these masterpieces concerning range and register for the clarinet. The presentation is straightforward; the music is labeled with track numbers, so that students can practice with the accompaniment CD. Mauz did a fantastic job cultivating and arranging all of these works in a musical, effective way so that beginner students develop their technique and artistry. It is not an easy task to find repertoire for beginner clarinetists that is both enjoyable and educational. These arrangements are a great way to introduce students to music from the Romantic period. 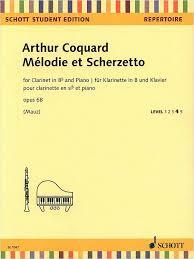 Composer, music critic and lawyer Arthur Coquard (1846-1910) composed Mélodie et Scherzetto in 1904 as a contest piece for the Paris Conservatory, dedicating the work to French clarinetist Charles Turban. The work itself presents two contrasting sections bearing the Romantic influence of Coquard’s teacher, César Franck. Coquard weaves a dramatic tapestry in the piece’s six minutes, providing moments of passionate lyricism, technical flourishes and a delightfully effervescent Scherzetto theme. Editor Rudolph Mauz presents a clean and lucid copy in the Schott Student Edition, buttressed by his clear and thorough teaching notes. Mauz gives measure-by-measure advice regarding breathing, phrasing, articulation, note grouping and technique, though he does not mention that the recurring Scherzetto theme will require a rapid slide on Boehm system clarinets lacking a left-hand A-flat/E-flat lever. Schott’s Student Edition scale grades this piece a level 4 out of 5. The name Reynaldo Hahn (1847-1947) should be familiar to clarinetists: his Sarabande et Théme Variè for clarinet and piano was composed in 1903 for the Paris Conservatory examinations and is a popular recital piece. Hahn was a prominent member of the Parisian music scene, and the bulk of his catalog tilts toward vocal music, with numerous operas and songs. Composed in 1892, Fêtes Galantes is the 11th song in the set 20 Songs, Book One, and has become one of the most popular encore works on song recitals. Its jaunty but not overly difficult piano part paired with a pleasantly melodic vocal part that only spans an octave makes it a logical choice for an arrangement for clarinet. Joshua Mietz, an instructor of music at Casper College in Casper, Wyoming, accomplished his stated goal with this arrangement: “This piece … will work well for students needing a shorter composition for contest, professionals desiring a charming encore piece, or for a recital shared with vocalists.” The song remains in its original key of G major and the piano part is identical to the original. As is customary with Potenza’s music printing, the typeset is clear and the page turns are logically arranged to allow the pianist to turn the page on a written rest without the aid of a page-turner. 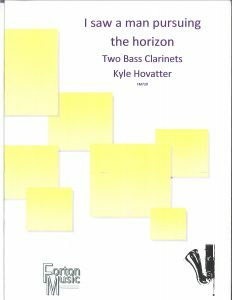 The clarinet part is one page in length, A major for B-flat clarinet on one side and a B-flat major arrangement for A clarinet on the opposite side. 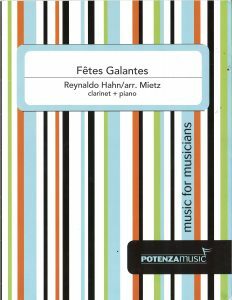 Fêtes Galantes is a fine choice for a short piece with a narrow melodic range that is a crowd pleaser. The songs of Debussy offer a fertile repository of beautiful music that can be arranged in a host of interesting ways. They are adaptable because the music is undeniably excellent, with innovative harmonic colors and enthralling melodic contours. 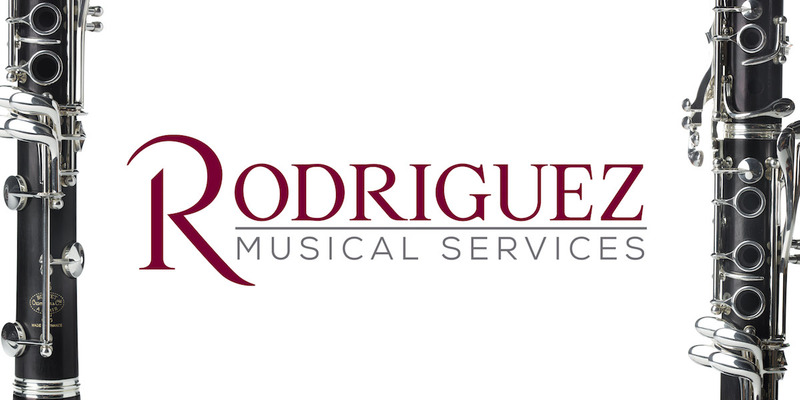 The choice of songs by Wagner Campos (DePaul University) and longtime piano collaborator Roderick Ferguson (Chicago Academy of the Arts) spans Debussy’s catalog – a fascinating collection for those wishing to incorporate some of his wonderful songs in performance. Beau Soir (1890-1891) is one of Debussy’s most frequently performed songs arranged for other instruments. Its plaintive melody, soaring climax and short duration make it a perfect recital piece or encore. The second song in the set is C’est L’extase from the 1887 song cycle Ariettes Oubliees. Chanson Espagnol is an 1883 song for two voices and piano. This arrangement captures the Spanish flavor that was en vogue during the end of the 19th century. The final setting is a daring one: the Recitative et Air de Lia from the lyric scene L’Enfant prodigue (1884), orchestrated in 1907. The printed piano music is clear, with wide measures for improved clarity. Two clarinet parts come with the published music, one in B-flat and one in A. Campos recommends the A clarinet be used in performance, allowing for friendlier key signatures. Campos and Ferguson’s transcriptions are artfully chosen and executed, allowing the clarinet to display its palette and versatility. Considering its popularity among non-singers, a sensitive Beau Soir transcription is long overdue. The recitative and aria would be a bold choice for performance with orchestra. This collection is excellent and certainly more than the sum of its parts. Kyle Hovatter (b. 1986) is a composer, organist and pianist based in San Francisco whose works have been performed by bass clarinetists including Lara Mitofsky Neuss and Sqwonk’s Jon Russell and Jeff Anderle. I saw a man pursuing the horizon is titled after Stephen Crane’s short poem. Hovatter’s musical setting depicts the physical motion of Crane’s line: “Round and round they sped” with a fast tempo and energetic rhythmically-locked back and forth motion between the bass clarinets. This chase begins with a two-note syncopated leap to lowest D from the D an octave above. This same interlocking octave material is repeated midway through the work and in modified, elongated form closes the duo. Hovatter’s piece stubbornly sticks in (printed) D natural minor – there is little harmonic variety except for a dozen G sharps. Perhaps these are the attempts, as Crane wrote: “ ‘It is futile,’ I said, ‘You can never – ’ ”? The two bass clarinet parts are equal and require accomplished dexterity to rapidly cross the B-flat to C register break. This is a minimalist-oriented piece that drones in a very present state of mind (D minor) and is doubly intense due to the prominent low D’s…beyond that, it mimics Crane’s observation and is “futile” to express more. Liz Sharma (b. 1951) is an accomplished English composer, author, teacher, administrator and wind instrument performer. 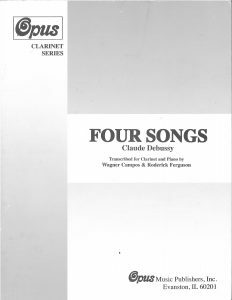 Written for three B-flat clarinets and bass clarinet (to low E-flat) Oceans of Life is a charming intermediate level work in four movements: “Creatures on the Edges of Tides,” “Dolphins,” “Whales” and “Teeming Shoals.” Each clarinet part is interesting to play and rhythmically independent. The textures are mostly contrapuntal and imitative. Parallel thirds and an occasional modal inflection may bring the music of Vaughan Williams to mind. Tempos and technical demands are moderate and the evocative titles and expressive lines make the whole appealing. I might use the music on a festival day with multiple players on each part. 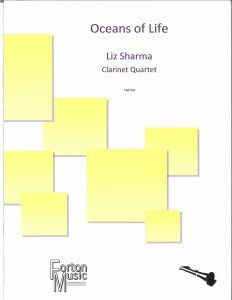 Forton Music offers an alternate version for woodwind quintet. 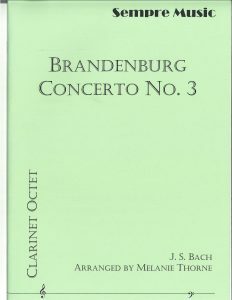 Of Bach’s six Brandenburg Concertos, the third, composed for the homogenous instrumentation of three violins, three violas, three cellos with contrabass and harpsichord most readily suggests arrangement for a clarinet ensemble. Melanie Thorne uses an ensemble of E-flat clarinet (or B-flat clarinet substitute), four B-flat clarinets, alto clarinet (or B-flat clarinet alternate) and two bass clarinets – with low F as lowest note. Bach’s original key of concert G major is raised a half step so that in the new key of A-flat major the B-flat clarinets play in notated B-flat major and the E-flat clarinet in F major. Occasionally Thorne expands Bach’s violin writing an octave higher in the E-flat clarinet. Each of the eight discrete parts is medium to hard in difficulty requiring excellent articulation skill to perform the running 16th notes for several measures at a time with only a few slurs – of course, additional slurs could be added. All in all, this is a realistic arrangement that will delight clarinetists with the music’s buoyant optimism.